1. 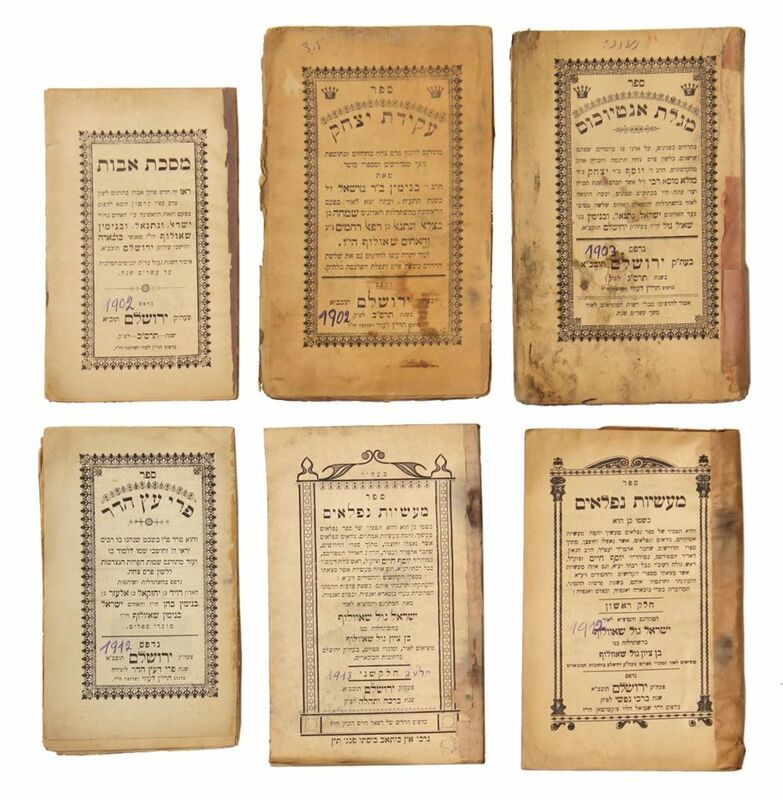 Chut HaMeshulash, printed by Luntz, Jerusalem 1912 2. Tafsir Darshei Tefillin. In Persian. A complete journal issue, not cut. Jerusalem 1922. 3. Tafsir Darshei Tefillin. In Persian. Some pages uncut. 4. Taharat Yisrael—halachot, by Rabbi Yehiel Michal Tikochinsky. Zuckerman printing, Jerusalem 1912. 5. Chanukat Zion—agadah. By Rabbi Yehezkel Melamed. HaChadash printing by Refael Haim Cohen, Jerusalem. 6. Khiyat al-Iyam—poems. By Haim Elazar Mizrahi. Jerusalem 1907. 7. Tafsir Em Efes. By Rabbi Ephraim bar Yitzhak. Printed by Lunz, Jerusalem 1905. 8. Pri Etz Hadar, Persian. Levi printing, Jérusalem 1912. 9. Ma’asiyot Nifla’im authored by the Ben Ish Hai. By Yisrael Gul Shaulof. HaChadash printing by Refael Haim Cohen, Jerusalem, 1913 10. Ma’asiyot Nifla’im authored by the Ben Ish Hai. By Yisrael Gul Shaulof. HaChadash printing by Refael Haim Cohen, Jerusalem, 1912 11. Masechet Avot with ancient commentary. Levi printing, Jerusalem, 1902. 12. Akeidat Yitzhak, Persian. Levi printing, Jerusalem. 1902. 13. Megillat Antiochus, Persian. Levi printing, Jerusalem 1903. Different sizes and conditions, ok to good condition.